Some of the latest research findings at the Faculty of Scence and Technology were presented at the Ångström Laboratory. What do we need to be able to overcome the major social challenges of the future? Researchers from the Faculty of Science and Technology presented solutions from their fields at an alumni event at the Ångström Laboratory. 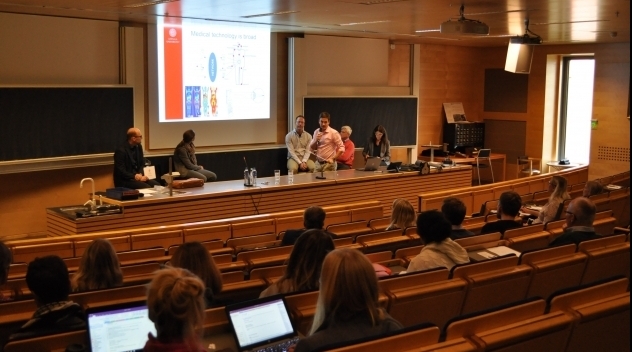 The event, Research and collaboration of the future was organised by Uppsala University Alumni Network and offered research presentations and panel discussions. Ulf Jansson, Professor of Inorganic Chemistry discussed Ångström’s new investments into additive manufacturing – or 3D printing. “This is an incredible opportunity for industry. You can create prototypes and develop products such as spare parts rapidly, not to mention design materials in a completely new way”. One interesting development is to create completely new alloys that can be used in additive manufacturing, which can lead to entirely different final products. have a large influence on the product’s environmental impact. The new Ångström Initiative is currently bringing together research activities in additive manufacturing at the University. Almost 15 researchers are working on development of everything from amorphous metals and high-entropy alloys to polymer composites and biocompatible materials. These types of smart and sustainable materials are expected to be indispensable in items such as magnetic components of electric motors and medical implants. A person in the audience wondered about the possibility of 3D printing cars, but this was something Ulf Jansson dismissed. Competing with existing car manufacturing techniques is out of the question. Nor does it make financial sense to produce anything other than individual components that significantly improve strength and performance. “Currently, the main areas of use for additive manufacturing include specific products for the aviation industry, where a great deal of weight can be saved. But there is still a way to go before mass-produced products”, explained Ulf Jansson. Charlotte Platzer Björkman, Professor of Solid State Electronics and researcher in thin film solar cells explained how her group is working to reduce the cost of solar cell systems whilst improving performance and efficiency. “Another highly important aspect is long run-time, to reduce both emissions and costs. Then, it is important to find solutions at system level – you cannot have just one component that works really well, it needs to work in a large system”. The moderator, Lina Sors Emilsson asked whether there is any value in investing in solar cells in Sweden, given the low average of daylight hours. However, Charlotte Platzer Björkman believes that Sweden has the same yearly amount of sunshine as northern Germany. In addition, solar cells are cost effective in Sweden if purchased energy is replaced. Fredrik Nikolajeff, director of the Uppsala Centre for Medical Technology addressed the need for larger platforms for solving major and difficult issues that will be faced by future social challenges. One example of where the University participates is the Uppsala Berzelii Technology Centre for Neurodiagnostics, that focuses on understanding neurodegenerative diseases such as Alzheimer’s, Parkinson’s, brain trauma, ALS and chronic pain. “We are currently working with infrared laser spectroscopy to profile molecular changes in the body. We have found some very exciting results with the discovery of structural changes to cells. Normally, this can take three years for a clinically trained eye to see”. Hence, there is potential to detect diseases at much earlier stages than at present. A further important addition is the MedTech Science and Innovation research centre that was launched at the University Hospital in June 2017. One question in focus is how the new centre can speed up the process of implementing new medical technology into healthcare. “This is where our alumni play a vital role – it is a matter of increasing discussion and exchange. Those of us in academia will be able to understand more about what is needed if we learn what issues are being addressed in the various sectors”, explained Fredrik Nikolajeff. Another researcher with experience of technology and medicine is Robin Strand, Professor of Computerised Image Analysis. The explosion of data collected in the medical field constantly requires more advanced computer aided support. “A typical radiologist would need 3-4 seconds to analyse and interpret and image. So a family of methods has emerged, that build upon neural networks – deep learning methods. These types of AI methods are a very hot topic at the moment”. In the Imiomics method developed by Robin Strand together with researchers at the radiology unit combines MRI data with smart algorithms in what are being called “correlation maps”. “This enables us to detect a connection between volume and fat mass in people whose total fat mass comprises a large volume of subcutaneous fat. Currently, we are applying the method to several diseases such as diabetes, oncology, obesity, metabolic and cardiovascular diseases in a bid to establish patterns in the enormous amounts of collected data. It is unlikely that academia or industry will be able to address these social problems alone; they must work together. This is the opinion of Jonas Åström, head of the University’s innovation support, UU Innovation. And the foundations for successful collaboration are already established during education through the educational culture of both second and third-cycle programmes and research. “At the University, we have developed a model for structural collaboration in what we call the ‘5i process’ that aims to find the right partner for each collaboration. In addition, it also includes Uppsala’s innovation support system in an exciting incubator environment, Uppsala Innovation Centre, that helps build teams around previous spin-outs”, said Jonas Åström. “But it’s not only about technology, it’s also about converting society. Here, I believe that as a broad university with research in the humanities and social sciences, we can also provide important insights into people’s usage and attitudes of energy and material consumption, for example”.